I wanted to start this piece with flowery prose about Uttar Pradesh and its exhaustive tourist delights. I wanted to play around with fancy adjectives and write how Uttar Pradesh is a treasure trove for travellers and tourists alike, how there’s much to explore and experience in this fourth largest Indian state in terms of area, and how there’s more to Uttar Pradesh than the much exalted Taj Mahal. I wrote sentences that sounded like paeans on state’s tourism potential, only to realise that I was missing out on the prologue to my Uttar Pradesh story. The prologue that (I am assuming) might ring true for many other fellow travellers and wanderers as well, the prologue that in a way is a little confession too. So here I start this piece with a confession rather. Uttar Pradesh never actively figured in my travel plans before the 2015 Uttar Pradesh Travel Writers Conclave. The opulent Taj Mahal had been struck off the must-see list long ago, Agra Fort and Fatehpur Sikri had been admired too, Sikandara and Baby Taj was appraised during a trip last year, and the thrill of the drive on Taj Expressway appreciated and relegated to travel memories. Honestly, with Agra, Uttar Pradesh had been ‘done’ with. Before you point out, of course there was Varanasi and Lucknow too. Varanasi – the much revered ‘Kashi’ of our scriptures, the greatest pilgrimage, the gateway of moksha – appeared intimidating. The images of intense crowd jostling its many ghats and tricky lanes and bylanes overwhelmed my puny frame. And Lucknow – every heritage lover’s bumper lottery, the land of nawabi splendour and impeccable manners, where every nook and cranny brims with intriguing stories of yore and where striking monuments stand vying for your attention – wanted time. And for now I had none to give. Later for sure, I promised myself. Occasionally, Mathura and Vrindavan too made casual appearances in my Uttar Pradesh map, during random conversations about grand Holi and Janmashtami celebrations in these towns, but then the conversations generally wrapped up with a fence-sitting – let’s do it next year. So this was Uttar Pradesh for me, a faraway land to be thought about and explored ‘some other time’. 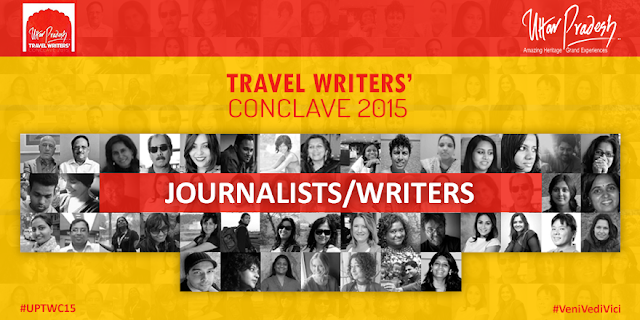 The Uttar Pradesh Travel Writers FAM and Conclave was an eye opener. The invite for the 2015 Uttar Pradesh Travel Writers FAM and Conclave, with its focus on promoting the heritage arc comprising Agra-Lucknow-Varanasi, seemed an interesting opportunity to experience first-hand the landscape, culture and heritage of these three historical cities. But then there was a catch too – participants had the choice of picking one city from Agra, Varanasi and Lucknow. While Agra was struck off the options right away on account of the fact that I had explored much of this city already, picking up between Lucknow and Varanasi was tricky. The heritage and street food junkie in me wanted to pick both these charmers but then I had to play by the rule and pick one. In between the to and fro from Varanasi to Lucknow, the intriguing aura of Varanasi edged over and the decision was made. And honestly, the idea of getting introduced to Varanasi and accessing its tough-to-navigate bylanes chaperoned by officials and guides from the state tourism department appeared too appealing to resist. Of course I had to go. Varanasi was a delight to experience. The early morning boat ride on the holy Ganges, the spectacular morning and evening aartis, spending sombre moments at the Manikarnika ghat, manoeuvring city’s tricky bylanes, relishing its traditional food and drinks and shopping for Banarasi silk – the Varanasi itinerary made sure that the travellers sampled the best of all that this antique city has to offer. Of course there’s more to Varanasi than these experiences, but given the packed schedule, the Uttar Pradesh Tourism officials made sure that the travel writers got to sample the best of the city in this short visit. In fact it would be apt to call this tour a tempting teaser, for it left me curious to explore Varanasi’s many historical sites, and monuments at leisure. The FAM tour also acquainted me with Uttar Pradesh’s tremendous tourism potential – its forts and palaces, its rivers and pilgrim centres, its traditional arts and culture, it’s wildlife parks and sanctuaries and last but not the least its full-flavoured food. In the next post, I will share in detail about the tour, taking you through my 3-day-long Varanasi excursion and the impeccably executed Uttar Pradesh Travel Writers Conclave in Lucknow. I am sure you will stay tuned. For more travel stories and travel trivia, you can also connect with me on facebook, twitter and instagram. Looking forward to seeing you there! Cool! Lovely to read about your Varanasi experience. Had I been asked to choose, I would have chosen Lucknow over the other two hands down. That is what I thought until I read more. The thought of exploring the the colorful city of Varanasi accompanied by people who really know the place and that too on a very tight schedule changed m mind. Look forward to know about the intricacies of the trip! It's my first time reading your blog and love your style of writing. It Must have been a fantastic Writers / Journalists conclave around 3 places, I'd love to hear your 3 day excursion in Varanasi. I'll keep coming back for more.